There’s is nothing more important at en event than the dessert and the 4th of July is no exception to that rule. 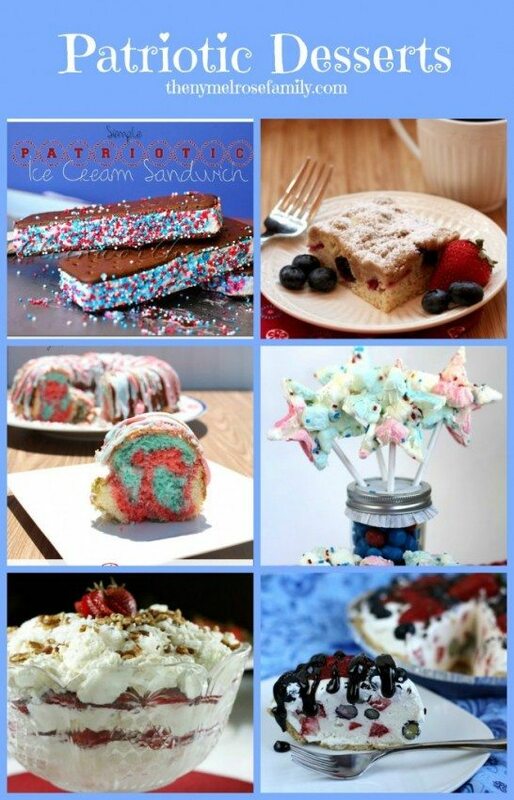 I’ve put together some of the best Patriotic Desserts that look delicious and are the perfect red, white and blue. Thanks for including my cheesecake squares, Jenny! Oh yum! I definitely have to pin these. Love these. I’m not much of a DIY person but my sister in law is. I think she’d like this. These all look fantastic! Thanks for including my Red, White, and Blue Poke Cake and my Patriotic Bundt Cake! So many amazing desserts – they all look delicious! Thanks for including my Raspberry & Blueberry Crisp! Thanks for sharing them all in one place. What a fun patriotic collection, Jenny! Thank you so much for including my Southern Strawberry Punch Bowl Cake. I’m honored! Great round-up, Jenny! You are great at including so many different people and awesome ideas! Great roundup! I hope you’ll share your best post of the week on my Friday Flash Blog Linky Party going on ALL weekend at The Jenny Evolution. Love these recipes! All so delish – great roundup! Thank you so much for featuring my Homemade Raspberry Trifle! !